blahblahblah blamblamblam . . .
Do you remember when things worked? No, not the world---your body? Do you remember when everything in your body worked? Eyes 20-20? Memories sharp as tacks? Ears tuned to pin drop on velvet cushion? Do you remember skin so supple and soft . . .
A bruise? A mosquito bite? A pimple? . . . Oh no! too stark to be forgotten or forborne! light tinting the blush of her pearly cheek. 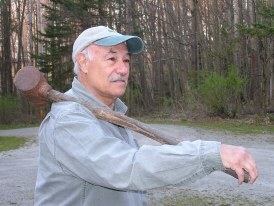 Steve Coffman has had numerous plays produced (including by the Smithsonian Institution), much short fiction published (including in Redbook's Famous Fiction, Vol. II), a memoir How To Walk A Pig (republished as Chicken Justice), two books of political essays and poems, Peace Meal and Messy Freedom, and the quasi-historical book Founders v. Bush. pigs, chickens and many acres of glorious trees. is a 52 page hand-sewn paperbook with spine - $12.00. To order through mail click here. Always Picking on Me, The All-American Bowl Final Quiz and Addendum Katrina. I thought you had just the right touch regarding Katrina." "Your latest book (Messy Freedom) should be required reading for every politician in Washington, D.C."
Ever Want To Be A Republican? Was Howard Really My Man? Why Is Everybody Always Picking On Me? Karl Rove and his Bushite buddies know that there's nothing like a good war to bring the national family together---in a rousing patriotic feast of hate and fear. Why limit your vengeance to the guilty few when you can take down (er, liberate) a whole country. Or, better yet, two or three? Even if you don't get the guys who did it, at least your friends get rich off the war, the plunder and the rebuilding. If you put your mind to it, you can always find a war. If not Afghanistan and Iraq, how about Cuba or Korea or Iran? If not Haiti, how about Venezuela? Or Nicaragua? Or those Mexicans? Or Indians? Before 9/11, we had the Lusitania, the Maine, the Mayaguez, the Gulf of Tonkin, Pearl Harbor, the Alamo. Panama? Columbia? Salvador? Grenada? Don't you understand? It was either them or us---we had no choice! Those fearsome Salvadorans and Grenadans were coming to pollute our air and water! Cut down our ancient forests! Steal our oil and rubber and bauxite and tin! Replace our hospitals with prisons! Rewrite our Constitution! Brainwash our children! In times like these, we must bite our tongues, corral our protesters in pens like slaughter-ready cattle and always be prepared to prostrate ourselves and avert our eyes before the powers that be. Oh, wouldn't that make our country's founders proud? Ben Franklin, for instance, who said: "They that can give up essential liberty to obtain a little temporary safety, deserve neither liberty or safety." Or James Madison who said (1788): "I believe there are more instances of the abridgment of the freedom of the people by gradual and silent encroachments of those in power than by violent and sudden usurpations." Or Thomas Jefferson who said (1789): "Every government degenerates when trusted to the rulers of the people alone. The people themselves therefore are its only safe despositories." that's the hand to use . . . well, never mind. Oh, shush now. You and Paul and Ralph and Dennis and Howard. You're mushy-hearted and kind of funny sometimes, but so hopelessly romantic and naive. In this Depraved New World of ours, don't you get it that perception creates reality? Maybe that's the real Culture War going on here. Not "Are you moral?" but "Who you gonna believe---the spin machine or your lyin' eyes?" Well, instead of gasoline, try putting perception in your gas tank and see how far you get. Instead of paying steelworkers and engineers, let your PR man and ad agent build your next skyscraper. Instead of farm-grown food, have a meal of Virtual Victuals (patent pending). Instead of going to a doctor, go to an actor. Instead of giving your diabetic child insulin, try a placebo and a prayer. Instead of assuming any moral responsibility for what you or our country does, just put a flag pin in your lapel or a sticker on your car. We as a nation desperately need someone real to slap us in the face and say: "Wake up now, our sweet darling America, it's time to wake up!----"
A high-tech society that wants to run on faith instead of scientific method? That thinks BMWs come from waving a Blessed Magic Wand? That expects bananas to appear like manna at the snap of finger and thumb? What we need are fewer Framers and more Farmers, fewer Ad-men and more Dad-men. 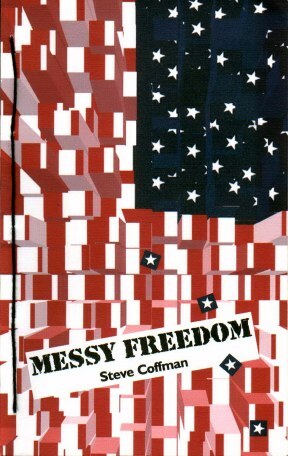 Messy Freedom is a 100 page hand-sewn paperback with flat spine - $15.00. In March, 1965, at the University of Michigan, I attended the first Vietnam War teach-in and learned why our government's reasons for our deepening Indochina involvement were based on historical ignorance and political lies. Four years later, at the height of that insanity, I was reclassified 1A for the draft and was suddenly faced with the choice of going to prison, leaving the country I loved, or betraying my own sacred code which did not allow killing innocent people for bogus motives. December 1, 1969---on my 27th birthday---I received the best gift of my life, a high number in the new Draft Lottery that freed me out of that hideous Hobson's choice. August 1972, my wife Bobbie and I left Ann Arbor with baby Zack and moved to a former farm in Yates County, NY---with grandly simple desires to get back to basic verities, grow our own food and raise our children in a rural environment. April 1, 1974, I had a knee operation at St. Joe's in Elmira and shared a room with a young man who had just returned from Vietnam and was suffering from an uncontrolable bleeding ulcer. All night we talked and shared what we knew, several times crying together at the senseless destruction of it all. These Bush years have reminded my heart and gut and brain of Vietnam. Seeing my country once again being led to war in manufactured ignorance and fear, I've tried to conjure all the love and logic and satiric barbs in me to dissuade us from embarking down an equally unwise and immoral road. I marched, I protested, I wrote. Since 1965, I've mostly been a writer of fiction and plays and my country memoir How To Walk A Pig. But this book is a collection of writings forced out of me by our times. From the strategic pre-war fear-mongering in 2002. Through our inexorable march to war. And up to the first anniversary of our invasion, miles still to go before we sleep. JUST IN . . .
You've read about it, I'm sure. These Al Qaeda suspects we've captured, how we've got them naked, chained to the wall, semi-starving them, not letting them sleep for days, over and over changing the room temperature from zero degrees to a hundred. Not torturing them, mind you---we just call it subjecting them to "stress and duress". That's cute, isn't it. Almost as cute as holding them in Afghanistan and Guantanamo Bay where we don't have to allow them any human rights, or even recognize them as human beings. No lawyers. No charges. No trials. Not even a list of their names. Wouldn't Stephen King love this story? Wouldn't Orwell? Wouldn't Kafka? Too bad it's not a story. It's real. It's what our country is doing. Oh, this is cute, too. If they don't talk, we take them to countries like Egypt, Morocco and Syria to be interrogated by torturers. Oops, did I say "torture"? Well, we don't know if they're actually being tortured because we don't watch, we don't ask, and they don't tell. Kind of like those three monkeys, you know?--- See No Evil, Hear No Evil, Speak No Evil. I know that Donald Rumsfeld thinks it's cute because he laughs while he tells us about how cleverly we're torturing these captives without having to admit to it. And the President finds it pretty hard to resist a smirk, too. The really funny thing about it is that we were the ones who used to believe in "innocent until proven guilty", the right to face our accusers and defend ourselves in a public hearing. We were the ones who fought so hard for the Geneva Convention and the Nuremberg Trials. We are, of course, sickened by the barbarity of Roman crucifixions, The Spanish Inquisition, our own treatment of slaves, Indians and Salem witches. But this, this is good. Just ask John Ashcroft. This is justice. This is moral and ethical. This is legal and just. This is us at our best. But let's not be for torture because we're in any way barbarous or vengeful. No, rather let's do it because it feels good and we're so powerful that nobody can stop us. Just too bad we can't put it on reality TV. and powerless. It is really a great book! words so much of what we think and feel. Lots of laughter and a few tears at the truth you tell. sending me a copy! From your mouth to God's ear. phone your poem on page 59. And your last line, ending: "songbirds"
admiration for your indomitable spirit may come closer. For me, the cumalitive effect of your brief essays, is like reading a single anguished poem expressing the grief of a heartbroken lover. Your refusal to succumb to despair serves as an example to us all. 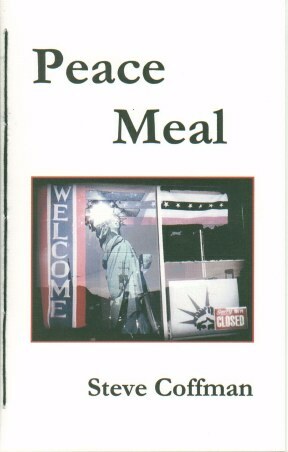 Peace Meal is a 72 page hand-sewn paperback with flat spine - $10.00.